Years have passed since the Vagrant journeyed to the Shining City, Vesper in arm and Gamma's sword in hand. Since then the world has changed. Vesper, following the footsteps of her father, journeyed to the breach and closed the tear between worlds, protecting the last of humanity but also trapping the infernal horde and all those that fell to its corruptions - willing or otherwise. In this new age, it is Vesper who leads the charge towards unity and peace, with seemingly nothing standing between the world and a bright new future. I completely loved this book. This was an epic conclusion to the story of the Vagrant. I won't include any spoilers... But I'm happy with the ending and the uncertainty of the future of the characters. I hope the story is left as is and maybe stories of the other characters. I did feel that the fighting was a bit rushed, I personally prefer longer and detailed combat in my reading. And Jot Davies brings a tinge of melancholy and a tickle of joy that with this whole trilogy is a perfect marriage. A great continuation to the first book. I loved listening to both, finding the narration and storyline unique and entertaining. The books invoke a wide range of emotions, well portrayed through the variety of characters. The adventures are creative and the humour is refreshing! It must be said that in this trilogy, two things have to be readily accepted. The first, is Jot Davies. In The Vagrant, it is likely that the listener will benefit from the 1.15 or even 1.20 speeds to stay involved. Jot is a fantastic Narrator, as is evident from the outset, but the second adjustment one has to initially work for, is the reason for this speed change. Narratives and novels rarely come in the present tense. the Second person point of view takes time to grow accustomed to. The opening of this novel. when the plot takes its first step forward. Is gut wrenching. unexpected, almost uncalled for events take shape, and feature characters we're unsure of. There is pain, and confusion, and uncertainty, and Jot Davies takes us through the now-familiar Peter Newman style once again. Gem is infuriating. Vesper is frustrating. Their daughter is an adorable pain, who is a welcome addition in lieu of the usual goat sidekick. It must be said that to enforce the moods and tensions of the others, she is a driving part of the story. The Vagrant is the ROCK that this story rests on. Amidst the uncertainty, the worry, the flow of doubts that the tale brings, he has become the island in the stream. Certain, sure, willful. He has gone from the silent hero, to the scared father, to the doubtful man; and now he is the perfect protagonist. His actions are pure satisfaction, and his views are understood and unquestioned. Now that his personal development has come far enough, Newman has been able to use him as the moral axis around which our other protagonists can be moved. You root for him. You feel for him. And you judge every other character through his lens. His granddaughter, though a human sidekick, talks as little as his old goat, and yet still they paint a vivid picture of characters such as Gem and Delta, Vesper and the others. The Seven are wondrous to read about. As is their creator. Though one can realise the value of a vague history, it is those very vagaries that leave one with the incessant itch to read more. I would pick up and tear through any novel that hinted at the explanation of the suns, or the breach, or the world before the Seven slept for a millennia. 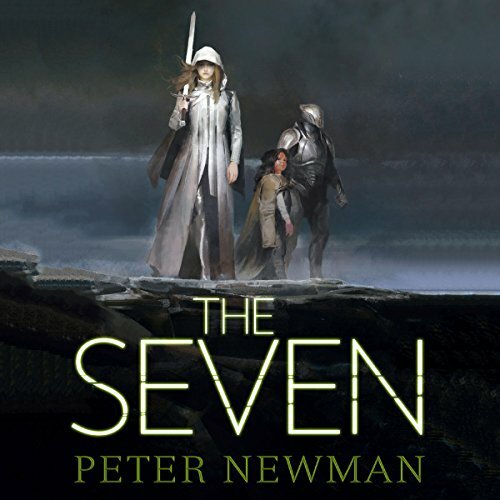 Peter Newman has successfully avoided the pitfalls of world-building, and brought us enough to tease our imaginations, without removing an iota of wonder from our experience. With no questions, what would be left to ponder? The Infernals, like the humans and the Seven, are shown with depth and grace. To portray the diversity of personality, even amongst extra-dimensional beings, is quite clever. The caned duo, the thousand nails, the manshape, and the first all exhibit qualities we have watched develop from alien points of view. And just like every other classification of life form in this novel, they have taken on quirks and flaws, even virtues that we can easily recognize. And yet, they are still foreign. Sammael and the Manshape, are perhaps the best Infernal examples of Peter Newman's recurring character theme. "I am learning that I do not have to be what I was made to be." Though many characters face this all-too-real idea; it is Sammael who highlights this in the most nuanced fashion. Still yet, as some characters change, so to do others stay the same. The First. Alpha. Gem. Each their own instance of someone who decides and commits to their world views. Each, though seeming villainous, can on some grudging level be understood. And sometimes pitied. And at times, agreed with. To blur the blind acceptance of heroes and villains with understanding, is what makes us seek to further understand others. Peter Newman has shown that when we see the source of someone's actions, we can no longer classify them so rigidly as good or evil. One dimensional characters are too easy to forget. As you can see, events are great to talk about, but as a spoiler free review...what matters here is that The Seven was wonderfully done. You get everything you secretly wish for, when you spend two novels waiting for a mute to SAY SOMETHING. You get to feel all the frustration of a problem solved, when you see that some people don't even care to fix it in the first place. And you get everything you hate, when you realize that just because the first step is taken, the world is still in such a fragile place that you fret over imperfect characters being left alone to fix it. The worst part of this novel was that upon closing it, I wasn't satisfied that everything was going to be okay.